Little is known of the early life of St. Dimitri. He was born into a rich merchant's family in Pereyaslavl-Zalessk in present day Yaroslavl Oblast and entered early on a religious life. He was tonsured a monk at one of the monasteries in Pereyaslavl. Later, he founded the cenobitic monastery of St. Nicholas near the city on Ss. Boris and Gleb Hill on the shore of Lake Plescheevo. He became its hegumen. In 1334, Dimitri met St. Sergius of Radonezh who had come to Pereyaslavl to visit the local hierarch, Metropolitan Athanasius. From this meeting a close friendship grew as they would often conversed with each other. The holiness of hegumen Dimitri spread widely. He became the godfather to the children of Grand Prince Dmitri Ioannovich. As he became more famous, and encouraged by St. Sergius, Demetrius looked to a more isolated life and decided to move to a remote place. With his disciple Pachomius, he traveled north to a spot near Avnezh at the Obnora River in the Vologda forests. There they built a church dedicated to the Resurrection of Christ and prepared to lay the foundations for a monastery. The local inhabitants, however, fearful that their village would become monastery property if a monastery were built there, demanded that the monks leave their territory. The two monks, wishing not to be a burden to any one, moved further north. At an isolated spot not far from the city of Vologda, Dimitri decided to establish at a bend of the Vologda River the first cenobitic monastery of the Russian North. The people of Vologda and the surrounding area welcomed the monks and gladly consented to help Dimitri. The monastery was built on land owned by Elias and Isidore who even trampled down a grain field so that a temple might be built immediately. By 1371, a wooden cathedral, dedicated to the Savior, was built and brethren began to arrive at the new monastery, including many disciples of Dimitri who came from the Pereyaslavl monasteries. The monastery would later be known as the Spaso-Prilutsky Monastery. Dimitri established a life at the monastery that combined prayer and strict asceticism with kindliness. He fed the poor and hungry and took in strangers. He conversed with those in need of consolation and gave counsel. And he loved to pray in solitude. His Lenten food consisted of prosphora with warm water. On feast days, he would not even partake of the wine and fish that was permitted by the Rule. He wore an old sheepskin coat during both winter and summer, and, even in his old age, he joined with the brethren on common tasks. 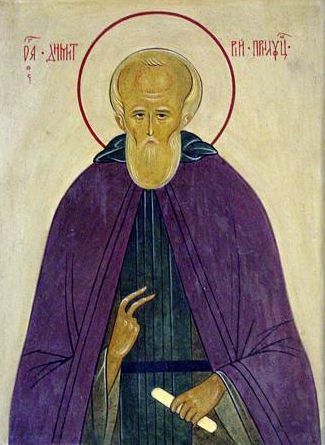 St. Dimitri accepted contributions to the monastery cautiously, so that the welfare of the monastery would not be detrimental to those living nearby. The Lord granted His servant the gift of clairvoyance, in which the saintly monk attained a high degree of spiritual perfection. On February 11, 1392, St. Dimitri died at an advanced age. As the brethren approached his cell at the time, they found him as though asleep and with his cell filled with a wondrous fragrance. Miracles associated with the relics of St. Dimitri began in the year 1409, and during that century his veneration spread throughout all Rus. By the year 1440, the Priluki monk Macarius recorded his Life (Great Reading Menaion, February 11) based on the narratives of St. Dimitri's disciple Igumen Pachomius.